In particular, the post over time graph looks different for Said's stuff, which is somewhat confusing, though I guess it kinda lines up. I notice that you do have some stuff in 2008, and it's aggregated weekly instead of monthly. We filtered out a bunch of stuff marked as spam on our side, but that shouldn't have even reached your side. Said, thanks for doing this, and also for running GW! It looks like #posts/day is propped up by attention seeking, so it stays stable; while #comments/post is a more genuine indicator of health, and shows a slow decline. Also it's curious that the relaunch of LW didn't affect metrics much. Wonder what the mods would say about this. Median number of comments/post seems to have gone up a bit since the relaunch, at least according to the graphs I posted below. 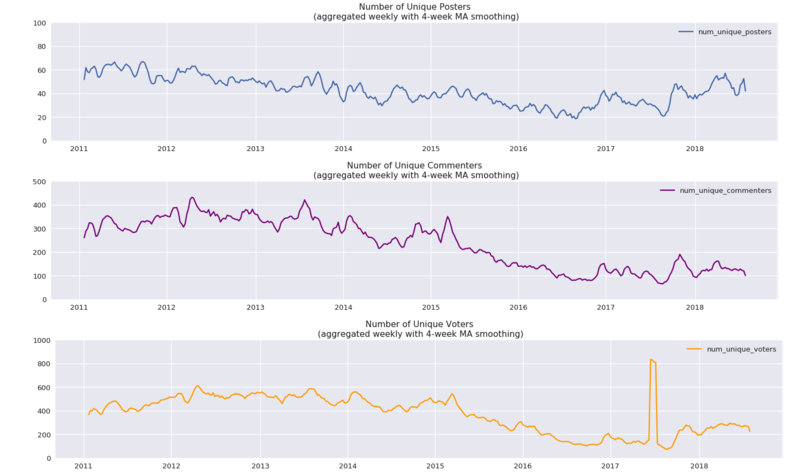 Average number probably has probably stayed roughly the same, which I think is mostly the cause of Scott moving to his own blog, and his posts continuing to create infinite amounts of comments. 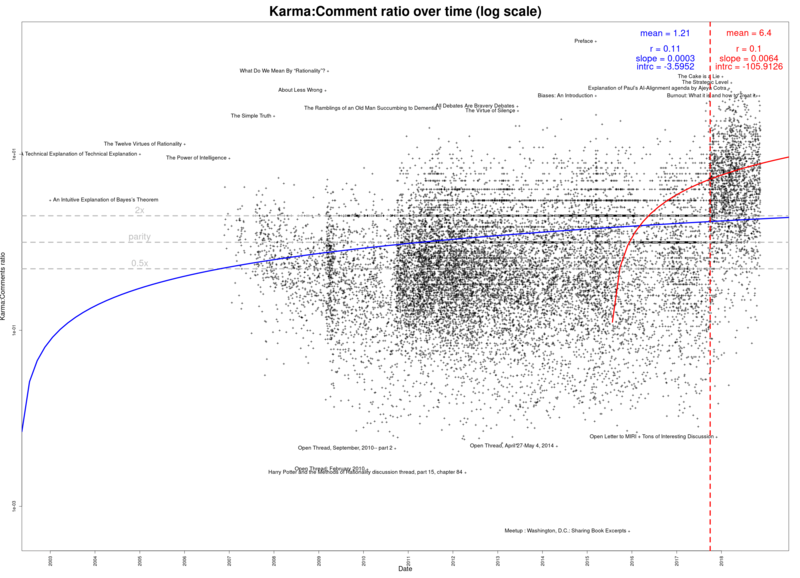 Overall, I think the launch shows up relatively clearly on a bunch of the metrics I posted below, and it's too hard to eye-ball scatter plots to judge on the plots above, though I agree that the overall effect of the relaunch on number of comments is relatively minor. I actually appear twice on the list of most prolific authors - Casebash and Chris Leong are both me. Hopefully, I can get my two accounts combined at some point. It isn’t a fitted curve, no. It’s just a trend-line, which looks curved due to the log y-axis. It’s computed, yes. And I defer to your grasp of the terminology! And yes, separate trend-lines for before and after the red vertical line might have been good; if the graph’s creator makes such a version, I will post it. 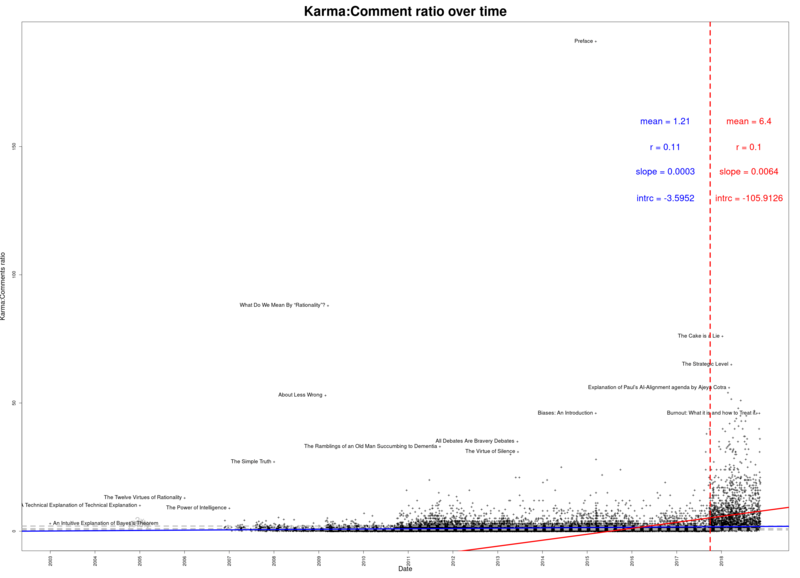 Hmm, the shift there seems mostly the cause of the changes to self-upvoting, as well as the increase in average karma weight. I think you might be able to adjust for that a bit by just using the vote count field (though obviously that ignores the difference between upvotes and downvotes). You could also resolve every individual anonymized vote and then count the upvotes to properly adjust for this, but that might be a bit of a pain. What's the unit of measurement for "most prolific author"? Karma? It’s just number of posts written. And I take it comments aren't post for that count. No, posts are posts, and comments are comments.